Gail Shaw Explores Watercolor Techniques. 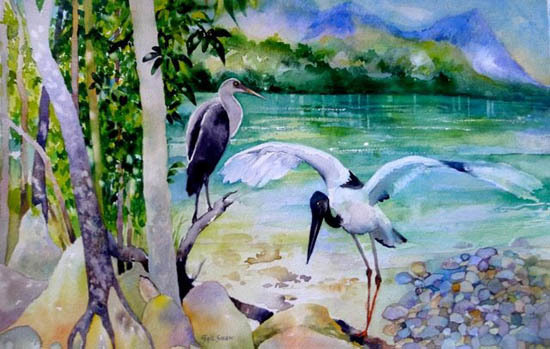 Watercolor Techniques Help Gail Shaw Explore The Essence Of Nature. Her watercolor techniques are the result of Gail's own experimental forays into this traditional and amazing medium, as well as of the teachings of highly respected artists. For the past twenty five years Gail has been on a journey of discovery, using what she describes as the 'magical' medium of transparent watercolour. "You never know exactly what will happen when water and pigment meet paper and it's this surprise element I love most about watercolour", she says. 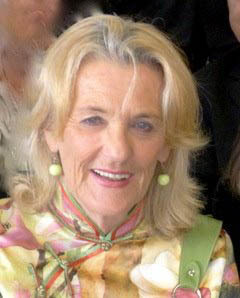 After a long career in advertising as a writer, designer and creative director with major agencies both in Australia and overseas, Gail and her husband, Robert Hanan, moved from Sydney to the Whyanbeel Valley, just north of Mossman in Far North Queensland, in 2005. Working from her custom-built studio on the edge of the world's oldest rainforest she is never lost for subject matter. "There's something so mysterious and elusive about the forest - its ancient plants and remarkable creatures - elements which, I feel, are mirrored in the elusive and unpredictable nature of pure watercolour. Every day I look out through the windows to this wonderful world of glistening greens, moody purples and blues; the air is clear as crystal and, strange as it may seem, my paintings often attract visitors such as tiny golden beetles and iridescent sapphire bees. Then there are the butterflies, moths and the occasional tree snake for company." Gail has studied at the Julian Ashton art school and with major watercolour artists, including Joseph Zbuvic, Alvero Castenet, Cherry Hood and Amanda Spencer. For ten years she was part of the group exhibition "Visions in Watercolour" at the Balmain Watch House Gallery. She was also a volunteer art teacher for several years at Lou's Place, a women's refuge in Sydney's Kings Cross and, on coming north, a watercolour teacher and exhibitor with Arthouse Port Douglas. 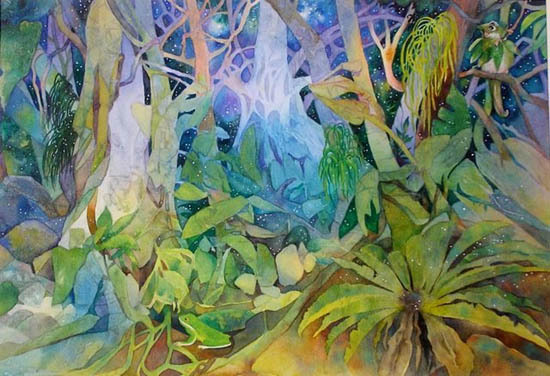 In 2010 Gail received a RADF grant for an exhibition "Painting Paradise" at Diane Cilento's Karnak Playhouse in the rainforest of the Whyanbeel Valley, north of Port Douglas. She has also exhibited at the Cairns Regional Gallery. 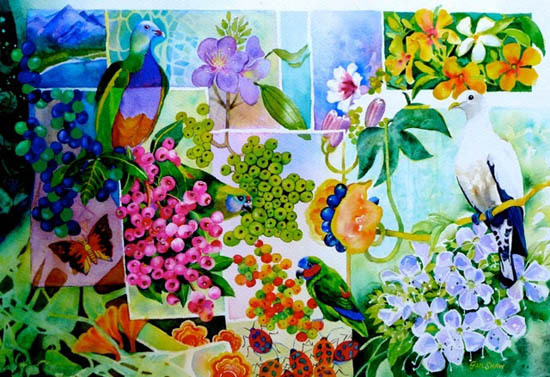 She conducts weekly watercolour classes in her studio from May through November and delights in the opportunity this provides to, not only share her knowledge, but also the exceptional beauty of her tropical world.